Zak made notes, grateful it was a nurse who had made the discovery, though this one seemed on the verge of losing her professional calm. From his training at the academy—which he’d finally convinced the sheriff to pay for after two years of working and learning on the job with precious little in the way of instruction—Zak knew lots of people blanked out, or panicked in a tragedy. In the simulated emergency situations during his training he’d scored well for his ability to focus logically on what needed to be done. That same urgent yet calm focus came over him now. “Do you recognize her, Farrah?” In a county of less than three thousand citizens, this was more than possible. Zak forgave him his confusion. In all his career Sheriff Ford had probably fielded only a handful of calls like this one. Yes, death occurred here. Lots of it. But potential homicide? Very rarely. Zak repeated everything Farrah Saddler had told him. Doctor Pittman was the local coroner and Zak had his number next on the list. He caught the doctor, a widower in his mid to late fifties, at his breakfast table. Pittman took the call with the measured calm of a man who had weathered a good many emergencies in his decades of being the only doctor in town. Pittman assured Zak he’d be at the scene pronto. “Thanks, Doc.” Next Zak called Butterfield, who claimed to be on his way to work, even though Zak could hear his wife talking in the background. Just as Zak was about to move on to Deputy Black, she stepped into the office. Zak had scored top marks in his anti-bias training, too, but he could not help appreciating the snug fit of her regulation trousers and shirt. She had her golden hair up in a bun, which formed a handy backstop for her aviator sunglasses. “What are you staring at?” She slung her jacket on a peg, then moved toward the coffee machine. The woman had attitude, no doubt about it. “Homicide,” Deputy Black said again. Then she smiled. “And I didn’t think there’d be any action in this one-horse town.” She poured a generous splash of milk into her cup, then downed the coffee in several swallows. When she set down the empty mug she clucked at him with mock sympathy. Zak shrugged. Black often tried to goad him, but as the runt of a litter of four boys—the three oldest much taller and broader than him—he’d learned to never rise to tossed bait. Zak’s answering smile might be a front, but no way was he going to let on his true feelings about his profession, certainly not to Black of all people. Finally he’d shut her up. She snatched the evidence kit and her jacket and left. 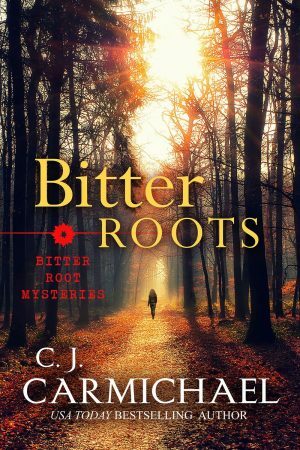 Did you know that Bitter Roots and many titles are available digitally from Tule's own bookstore? Check it out!